In this edition of Muscle Car Milestones, we’ll turn back the clock and look at the 1973-1974 Pontiac Firebird and Trans Am Super Duty. In a time when muscle cars were becoming as extinct as the dinosaur, Pontiac did the unthinkable and unleashed the Super Duty on the buying public. The Firebird and Trans Am Super Duty were truly the muscle car’s last hurrah. In a time when insurance rates on muscle cars soared and rising gas prices were becoming the norm, the Super Duty was something of an anachronism. The Super Duty was launched at the beginning of what was to become known as the Malaise Era. A time when oil embargoes, the Clean Air Act, and cheap economy cars had taken their toll on muscle car sales. An era when the GTO, Mustang, and Charger were now shadows of their former selves. Before 1973, horsepower dominated and it seemed the Big Three couldn’t make enough muscle cars to satisfy the buying public. What a difference a few years makes, huh? However, it seems the folks over at Pontiac didn’t get the memo. For 1973, Pontiac introduced a version of the 455 cubic-inch V8 called the Super Duty or SD-455. This engine was hand-built with a heavy duty block, forged aluminum flat top pistons, and Rochester 800 cfm four-barrel carburetor. The engine was rated at 290 horsepower at 4,000 rpm and 390 pound feet of torque at 3,600 rpm. Today, these numbers may sound miniscule but in 1973, this was top shelf muscle. The automotive press raved about the Super Duty. Car and Driver tested a 1973 Super Duty Trans Am for their May 1973 issue. With a 3-speed automatic, they were able to run from 0 to 60 in 5.4 seconds and dash the quarter mile in 13.8 seconds at 103.6 mph. You have to admit, those numbers are pretty impressive, even by today’s standards. Compared to the 1973 Chevrolet Corvette LS4 454 with the Turbo Hydra-matic, the Super Duty was one second faster from 0 to 60 and 0.9 seconds faster in the quarter mile. One thing that robbed the Super Duty of horsepower was the new exhaust gas recirculation (EGR) valve guidelines mandated by the government. Pontiac attempted to circumvent the regulations by creating a solenoid that would disable the EGR shortly after the engine was started. Pontiac engineers learned the Environmental Protection Agency’s EGR test lasted 50 seconds so they designed the solenoid to shut down the EGR after 53 seconds. Unfortunately, the EPA got wise to Pontiac’s mischief and necessitated the removal of the solenoid. In order to determine this action had been performed, the EPA instructed that the engines be painted a slightly different color so the inspectors could easily recognize them. It’s a wonder the engine was ever created at all. Pontiac brass almost killed the Super Duty entirely. 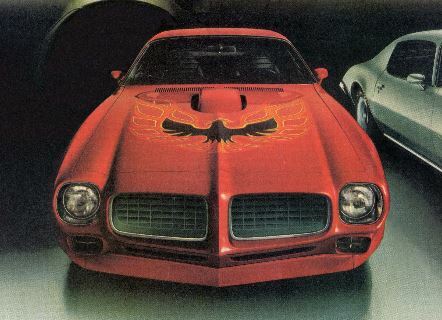 Pontiac sales literature from 1973 stated the Super Duty would be optional on several Pontiac models, including the Firebird, LeMans, and Grand Am models. Stock photography was even created showing SD-455 badging on the 1973 Grand Am. However, due to cost restrictions to certify the engine for each model, Pontiac made a concession. Since the Firebird and Trans Am were Pontiac’s premier sports car, the Super Duty was made available only for the Firebird Formula and the Trans Am. People like John DeLorean who helped pioneer the muscle car and led Pontiac through the 1960s were long gone. It seems current Pontiac management weren’t exactly keen on muscle cars any more. Identifying a Super Duty-equipped Firebird or Trans Am is fairly simple. Just looked for the SD-455 sticker on the hood scoop and and an “X “ code in the vehicle identification number (VIN). And speaking of hood scoop, 1973 was the first year the scoop was non-functional. Here again, Uncle Sam’s new drive-by noise standards required the scoop to be riveted shut in order to cut down on noise. Fresh air was now breathed under the hood through a long, rubber snorkel. Another interesting fact is the Trans Am Super Duty was only available only in Brewster Green, Buccaneer Red, or Cameo White. 1974 brought some cosmetic changes to the Firebird and Trans Am. A new aerodynamically-shaped front end was added along with black rubber 5-mph bumpers. The rear featured new slotted taillights and black rubber 5-mph bumpers. Production numbers are quite low for the Firebird and Trans Am Super Duty. In 1973, 43 Firebird Formulas and 252 Trans Ams were produced. In 1974, 58 Formula Firebirds and 943 Trans Ams rolled out of the factory. With so few built during their two-year run, it’s no wonder why a Super Duty can command such high prices at auction. For example, a frame-off restored, Brewster Green 1973 Trans Am with a four-speed transmission sold for $185,000 at the Mecum Indianapolis 2013 auction. As we mentioned before, the Super Duty was initially going to be made available in other Pontiac models. Hi-Performance Cars magazine was able to get their hands on a 1973 Pontiac GTO tester equipped with the Super Duty. They liked the car so well that they awarded it their “Car of the Year” award. Unfortunately, as the issue had gone to press, Pontiac yanked the Super Duty off the options list for the GTO. The award went to a car that was never produced. And just like that, the reign of the Super Duty was over. After a two-year ride, production ended at the close of the 1974 model year. With all the upheaval going on in the auto industry in the early 1970s, the Super Duty should have never happened. But it did. It just goes to show there were still some who were not ready to give up on a true muscle car at the beginning of the Malaise Era. Pontiac may be history now but the legendary performance cars they created in their time will be with us forever.